The day of discussion, debate and performance, running alongside the inaugural Other Voices Ballina, takes place on Saturday September 29th, 2018 from 11am, in the Jackie Clarke Collection on Pearse Street in Mayo town. 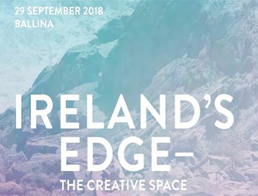 Intel’s Eamonn Sinnott, a member of the Ireland’s Edge team from the outset, and a consistent advocate of STEAM (the inclusion of arts alongside science, technology, engineering and mathematics), will present the keynote address addressing the importance of creativity in technology. Scientist – Astronaut candidate Dr. Norah Patten will speak about the conditions which must be put in place for creativity to flourish. Norah’s focus will be on the value of introducing young people to science, technology, art and the natural world from an early age and the importance of wider cultural engagement in places on the edge, like her hometown of Ballina, and how her community helped to shape and influence her life choices. Muireann Kelliher, Chief Development Officer at Glen Dimplex and co-founder of Ireland’s Edge will bring together some of Ireland’s most distinguished thinkers in design and innovation including Kim Mackenzie-Doyle, Head of Design and Innovation at Hub Controls and President Emeritus at Institute of Designers in Ireland, Enda O’Dowd, lecturer in Product Design at the National College of Art and Design and Michael Murray, Innovation Manager at Hollister in Ballina, for a discussion on STEAM’D and the role of design in bringing users into the heart of innovation, from ‘traditional’ applications in product innovation, to a much broader adoption in developments of services and systems, in the private and public spheres.